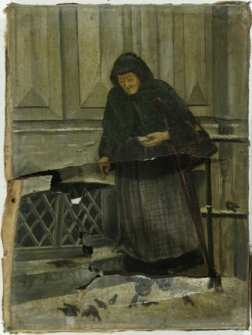 This quaint little painting of an Old Woman Feeding the Birds was recently brought to The Center for treatment due to the complex tear throughout the canvas. The painting, measuring 9 ½” x 7”, had fallen from the wall, causing numerous tears and pulling of the left edge of the canvas from the stretcher. The artist is unknown, but the piece is most likely from the late 19th/ early 20th century and an important personal item to the owner. First, the painting was carefully removed from the stretcher and flattened using light moisture and weights. By introducing moisture to the canvas, the fibers were able to relax without harming the gesso and paint layers; weights were then used to safely flatten the undulating canvas. A light layer of grime was then cleaned from the surface, followed by the removal of the thick discolored varnish layer. Paint losses along the tears were filled using gesso, and a synthetic resin varnish was applied overall to saturate the paint layer. By request, only minimal inpainting was carried out using reversible conservation paints. Although the treatment focused more on structural work, the painting is now enjoyable again, and the charming details can be appreciated once again.